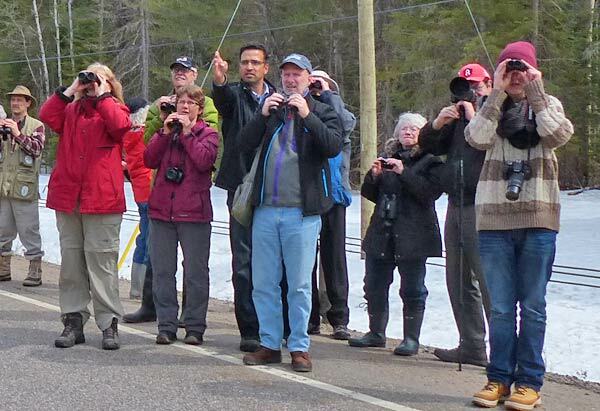 This was the 25th annual Ontario Field Ornithologists (OFO) trip to Algonquin Park. 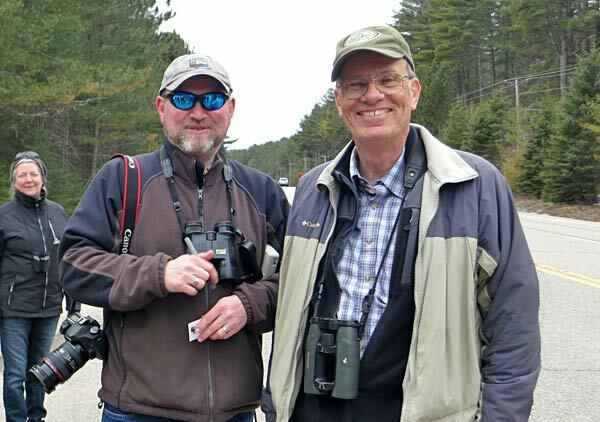 Always a favourite outing, about 80 participants joined leader Ron Tozer, assisted by Kevin Clute and Justin Peter, to search for boreal specialties. 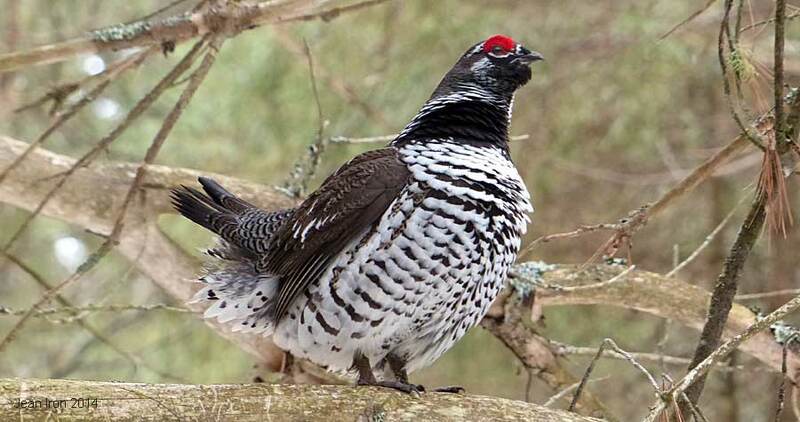 We had excellent views of this male Spruce Grouse at Spruce Bog Boardwalk, a life bird for many. 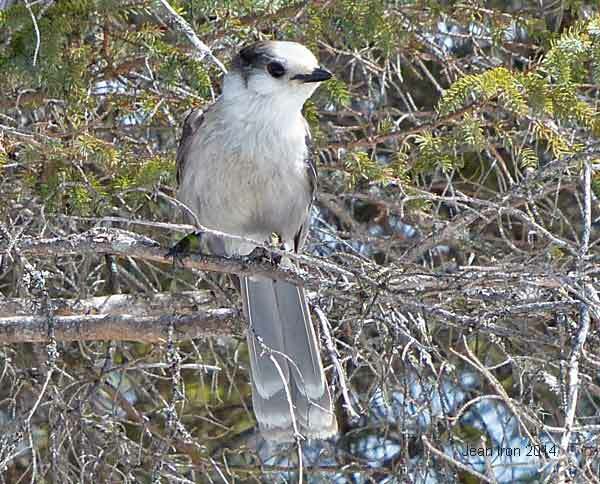 Algonquin Park's Gray Jays are banded as part of Dan Strickland's long-term studies. Gray Jays are more difficult to find at this time of year because the females are on the nest now and the males are more secretive when young are in the nest. We fed Gray Jays on Opeongo Road. They store much of the food. 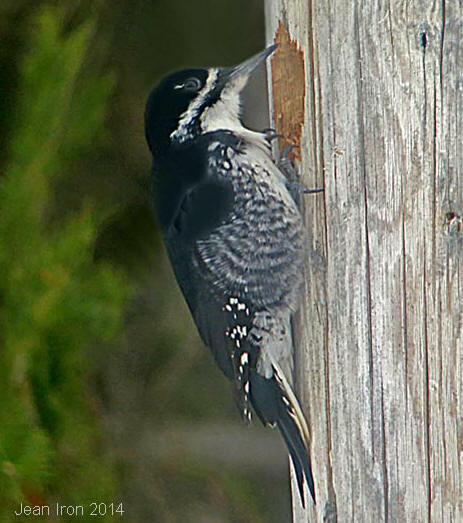 Male and female Black-backed Woodpeckers were excavating a cavity on a pole along Highway 60 opposite Spruce Bog Boardwalk. 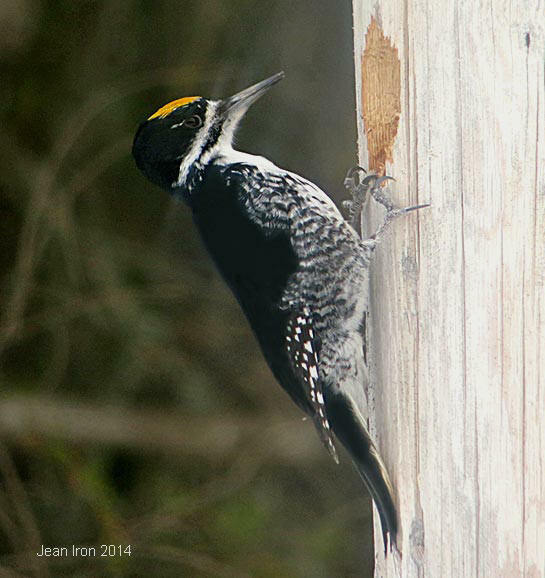 Click on photo of male woodpecker to see video. 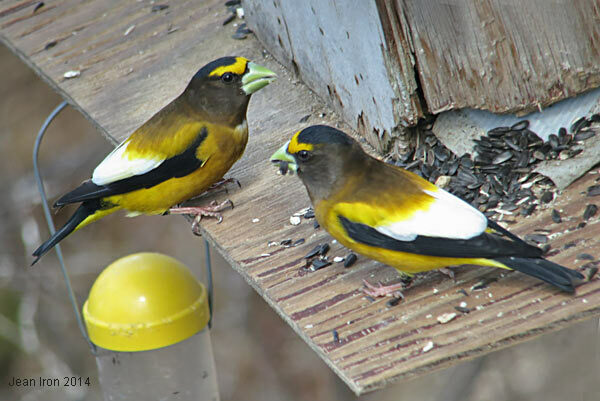 Evening Grosbeaks were at the Visitor Centre feeders. 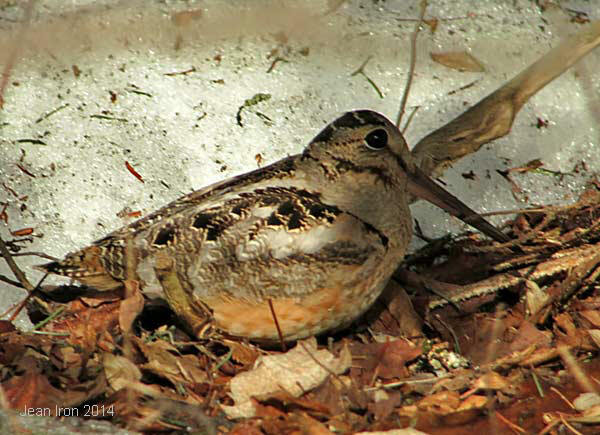 Our day started with an American Woodcock at the park's West Gate. A Moose was drinking melt water beside the road. Ron Tozer explained that Moose often have a mineral deficiency at this time of year, so they come to the side of the road to drink melt water containing salt that was applied to Highway 60 during the winter. This Moose is in good condition with very little damage to its coat from Winter Ticks, which can infest an animal and cause so much irritation that it rubs off a lot of hair, exposing bare skin to cold and wet. 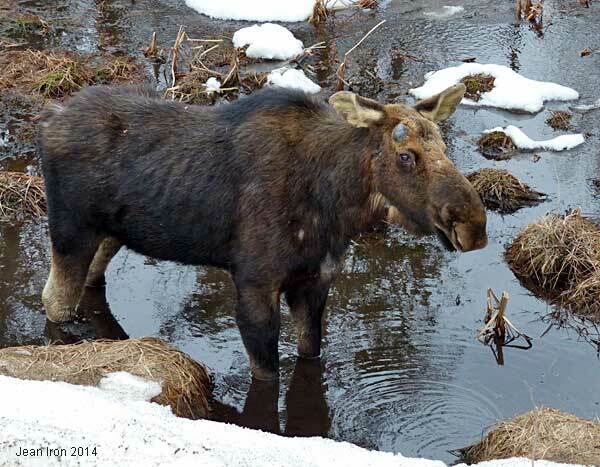 In some winters there is Moose mortality due to hypothermia from loss of fur. Click on photo to see video. 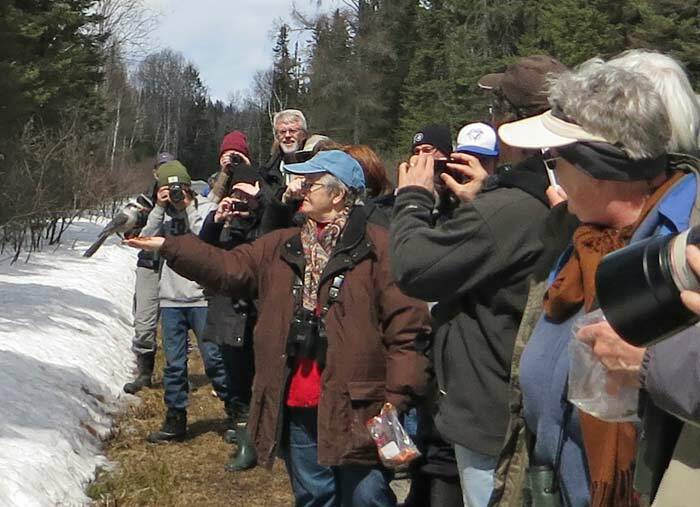 Justin Peter pointing to a Boreal Chickadee, one of several seen during the day. Ron Tozer (right) and Kevin Clute.